While driving from Central New York, it began. First, we thought it was the elevation as the sun had long faded and the air was colder. Around us the I-90 Thruway bustled with 18-wheeler trucks on their long haul. A call to our family confirmed our fear; winter was rearing itself early just days before Halloween. What a cruel trick-or-treat indeed. The historic October Nor’easter wreaked havoc covering the Mid-Atlantic and Northeast states. I unpacked winter coats, hats, and gloves along with snow shovels and rock salt. To my dismay, the snowplow arrived 10-minutes before midnight, greeted by loud barks from our dog. 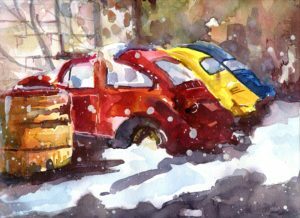 Her barking was only muffled by the snowplow blade scraping against the blacktop driveway, back and forth in what seemed slow motion and endless. The Berkshire autumn season was now accompanied by 15 or more inches of heavy wet snow. With the storm, the local landscape took on a new artistic promise. Scenes in town I had envisioned painting in autumnal brilliance, were now transformed with the addition of this white blanket. Mt. Greylock was a splendid site with orange and yellow trees capped with white highlights. Clumps of full evergreens added dimension to the unique spectrum of color. Among my favorite vignettes three busted, and rusting Volkswagen Beetles. The VWs aligned cleverly (or possibly without consideration) in primary red-yellow-blue sequence adjacent to the pharmacy in the heart of downtown. The subject of a vehicle parked for its final time has always captured my imagination and is a theme I paint often. I wonder about the last driver and what they were thinking. How long since someone opened the car door and sat inside? How was the hood crushed or the bumper dented? Why has it been abandoned and forgotten? Without knowing the answers to its story, the possibilities are endless. I think that is what I find intriguing. New original watercolor pieces inspired by #Snowtober are available from my Etsy Shop. Shop Small on November 26, 2011 and support artists and small business owners this holiday season.